This is a 16 oz. 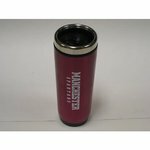 stainless steel travel mug with black plastic liner. Also has a stainless steel slide closure lid. On the travel mug is Manchester Spartans, too.